One night, many years ago, I had a dream where a book was opened in front of me, and the Holy Spirit put a spotlight onto the page. 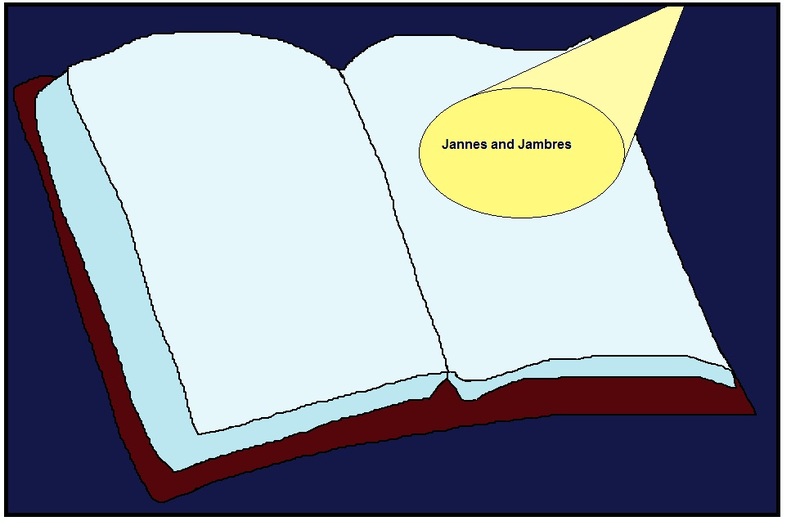 My eyes zoomed in like a Hollywood camera to see what was in the spotlight, and I saw three words: Jannes and Jambres. The next morning I went back to the book I had read the day before, and I read there that Jannes and Jambres were the magicians in Egypt. In the dim recesses of my memory I thought that I had read those guys names in the Bible somewhere, but I couldn’t remember where. So I went to the concordance expecting to find an Old Testament reference. (Those were the days before we had an internet computer.) To my surprise, I found their names only in the New Testament: 2 Timothy 3:8. I was taught that ‘All scripture’ meant the Bible, nothing more and nothing less. Yet, here was Paul quoting from a different Bible – right in the very same chapter! I wasn’t clever enough to see it for myself, so that is why the Holy Spirit had to sort of ‘rub my nose in it’ for me to see the light. Whenever I had read those guys names, I had just thought that they were some guys in the wilderness that hassled with Moses. So many times in my life, I have found that the things the Holy Spirit has taught me are different to what I have been taught by ministers of religion. Jesus said that the Holy Spirit will guide us into all truth. In fact Paul uses the word truth in that very verse: As Jannes and Jambres opposed Moses, so do these men oppose the truth. So the Bibles that people make today, are not the same as what Paul considered as scripture. Because of visions and dreams I have had where the Holy Spirit has ministered to me, I have read a lot of ancient writings, and have seen a lot of things that are different to what most people believe. So I am just sharing this one thing with you as an example, because it is right there in black and white in the Bible! Later on, we traveled back to North America, and a lady in the States was sharing about an ancient writing she had in her possession. I was very curious, and asked her what it was called. She said: “Jasher, or something, it is mentioned in the Bible.” So I went home to the concordance again, and found the Book of Jasher mentioned twice in the Old Testament. Joshua 10:13 and 2 Samuel 1:18. A little while later, we were at a computer course, and during the coffee break my wife suggested I search for it. So I did, and ordered a copy from the bookstore. The first thing I did was look through the whole book for Jannes and Jambres, and I found them mentioned in chapter 79:27. Some things in the Book of Jasher I found to be very exciting, but some things seem to be different from the Bible, so I am not sure what exactly to believe concerning it. Apparently there a different versions, so I am not sure what is the truth. I have also discovered that Jannes and Jambres are also mentioned in other ancient writings. So I am always searching for the truth. May the Good Lord bless and keep you till we meet again.